The Honourable Jody Wilson-Raybould, P.C.,Q.C., M.P. The 2017-18 year was marked with major advancements for human rights in Canada. As we celebrated the 40th anniversary of the Canadian Human Rights Act with partners, stakeholders and human rights defenders, we were also challenged by an unprecedented rise in the number of complaints from people who felt they had been wronged. The 2017 Human Rights Symposium provided an opportunity to reflect on how far we have come, and on both the barriers and opportunities that are generated by the different labels people place on each other. The event also prompted us to acknowledge the work that remains so that everyone in Canada has an equal opportunity to thrive in a diverse and inclusive society. In all of our work over the past year, our actions were guided by our continued priority to put people first. We expanded how we communicate with everyone by creating videos and leveraging our social media platforms to highlight current issues. We improved access to justice by making it easier for people in Canada to find human rights information and to file complaints. In doing so, we modernized our infrastructure to better protect the privacy and security of people’s information. We implemented several Lean recommendations to improve service delivery to some of the most vulnerable people in the country. We helped improve access to justice for everyone by offering an online complaint system. Along with this, however, came the challenge of responding to an unprecedented number of complaints with the same limited resources. In order to significantly improve service delivery and access to justice for all, the Commission should be making investment in its information technology and data management systems. At the present time, the Commission does not have the financial resources to do so. This investment would position us to better respond to current human rights issues such as accessibility, inclusion and harassment, especially for the most vulnerable and the middle class. This would also enable the implementation of interactive services while supporting the government’s priorities in terms of diversity, openness and transparency. During 2017-18, we were more outspoken than ever, identifying a number of pressing and emerging human rights issues. We provided advice to parliamentarians on various issues and pieces of legislation, including: accessibility, sexual harassment and violence in the workplace, systemic racism and religious discrimination, solitary confinement, and migrant detention. More than ever, the human rights expertise of the Commission was requested. In many cases, the Commission’s recommendations were not only accepted but included in the very words of the legislation. Over the past three years, the Commission has gathered audit findings that we used this year to create a database on employment barriers impacting the four designated groups (women, Indigenous peoples, people with disabilities and members of visible minorities). We also consulted with employers on how to better deliver our compliance mandate. Based on this information, we developed an issue-based audit model and launched a pilot audit on the employment of Indigenous peoples in the banking and financial sector. I am very proud of what we have accomplished this year in the face of the new challenges and pressures on our resources. I am also very grateful to our team members for their ongoing dedication to the people we serve. This year again, they gave everything they could to make it possible. Together with partners, stakeholders and our very dedicated staff, and through every decision we make and every action we take while putting people first, we are helping ensure that everyone in Canada is treated fairly, regardless of who they are. The Commission hosted a human rights symposium on September 27 and 28, 2018 to celebrate the 40th anniversary of the Canadian Human Rights Act. The symposium was designed to challenge our thinking and behaviours around labels. Participants included human rights advocates, academics, employers, lawyers, and engaged citizens from across the country. Participants explored how human rights education tools can be used to engage and empower youth to “go beyond labels” and promote respect for diversity in their communities. Participants explored the barriers faced by persons with disabilities, or as a member of the LGBTQ2I community. They explored the need to transcend the accepted concept of accommodation, and to reflect on the importance of a human rights framework that takes into consideration the intersection of various grounds of discrimination. Participants explored what social and economic inequalities look like and identified populations that are affected by them. Participants also participated in the KAIROS Blanket Exercise,™ an interactive learning experience that aims to foster understanding about our shared history as Indigenous and non-Indigenous peoples. By all accounts, this symposium was a great success. There was a sense of optimism and resilience, along with hope for the future through increasing awareness and understanding. The themes explored in the Symposium became a central part of the Commission’s public messaging around its 40th anniversary throughout the 2017-18 year. The result was a significant year for the Commission in terms of public engagement, public discussion, and reaching new audiences. The Commission produced a Beyond Labels video series featuring human rights leaders and individuals sharing their views on whether labels play a positive or negative role. People from across Canada took to social media to share their thoughts, to debate the ideas, to encourage others to join the dialogue. As well, the Commission produced the 4040 Project—a 40th anniversary video series that featured historic human rights milestones, current human rights issues in Canada and interviews with influencers from across the human rights community. The Commission took an active approach in monitoring proposed bills and new legislation in order to identify areas that would benefit from the Commission’s expertise on human rights matters. As a result, the Commission provided advice and guidance to parliamentarians as well as commented on various bills and issues over the past year, including Bill C-65 on violence and harassment in the workplace, Bill C-16 regarding the addition of gender identity or expression to the CHRA, the treatment of prisoners, Motion M-103 on systemic racism and religious discrimination, Bill C-59 on national security, various pieces of legalisation impacting Indigenous peoples, etc. Our advice was provided by appearing before parliamentary committees, making written submissions to committees and meeting with various parliamentarians and other stakeholders to discuss human rights implications of those bills. In many cases, the Commission’s interventions and advice were accepted and led to the inclusion of language focussing on human rights principles in the draft legislation. As planned, the Commission developed a horizontal audit model and launched a first pilot audit focusing on Indigenous employment in the banking and financial sector. As a first step, and in response to the feedback we received from employers during recent consultations, the Commission sent an audit survey to 36 employers to gather information on systemic barriers and positive practices. To reach a larger audience and for greater impact, the Commission will publicize general audit findings, including a gender-based analysis on Indigenous representation, in an industry-wide audit report. The Canadian Human Rights Commission was established in 1977 under Schedule I.1 of the Financial Administration Act in accordance with the Canadian Human Rights Act (CHRA). The Commission leads the administration of the CHRA and ensures compliance with the Employment Equity Act (EEA). The CHRA prohibits discrimination and the EEA promotes equality in the workplace. Both laws apply the principles of equal opportunity and non-discrimination to federal government departments and agencies, Crown corporations, and federally regulated private sector organizations. The Commission promotes the core principle of equal opportunity and works to prevent discrimination. Ultimately, the Commission helps to ensure that everyone in Canada is treated fairly, no matter who they are. As a national institution, it works closely with federally regulated employers and service providers, individuals, unions, and provincial, territorial and international human rights bodies to foster understanding of human rights and promote the development of human rights cultures. The Commission’s mandate also includes protecting human rights through effective case and complaint management. This role involves representing the public interest to advance human rights for all Canadians. The Commission is responsible for ensuring compliance with the Employment Equity Act. This involves auditing federally regulated employers to ensure that they are providing equal opportunities to the four designated groups: women, Indigenous peoples, persons with disabilities and members of visible minorities. This section describes the context and key risks associated with the Commission’s work. It identifies both external and internal influences and factors that may affect our core responsibilities. The Commission’s caseload has continued to increase. The reasons for this include a growing awareness of human rights issues and the introduction of our online complaint form. Making our system more accessible created a demand that was greater than what we anticipated. The online complaint form alone, a positive change that removed a significant barrier to access to justice, generated a significant increase in our intake process within only six months of operation. At the same time, two new grounds were added to the Canadian Human Rights Act in 2017-18: “gender identity or expression” and “genetic characteristics.” These two additions required the Commission to manage an increased number of requests received for information and guidance. Disability-related complaints continued to be a big part of the Commission’s work. Mental health issues continued to comprise a growing proportion of the disability complaints we receive. With this increase, the Commission continued to develop expertise, understand systemic issues and identify potential solutions or remedies. The Minister of Sport and Persons with Disabilities tabled the Accessible Canada Act. This has had a significant impact on the work of the Commission. It required our programs, policy and legal experts to determine how the new proposed law will impact our mandate. The Commission continued to monitor the government’s progress in implementing the decision rendered by the Canadian Human Rights Tribunal in 2016 which found that the government of Canada’s funding of child welfare services on First Nations reserves is discriminatory. The Tribunal has required that the government correct this situation. We have given increased attention to the use of solitary confinement in prisons which often has intersectional impacts on grounds of discrimination covered by the CHRA, in particular disability (mental health), race, national or ethnic origin, and gender identity. Finally, this past year saw an unprecedented surge of social movement and discourse regarding the prevalence of sexual harassment and assault in the workplace. All over the world, people rallied together, with grassroots movements such as “Me Too” and “He for She” galvanizing millions of people. At the same time, we saw action taken by the Government of Canada against harassment and sexual violence at work, including the introduction of Bill C-65 on workplace harassment and violence in the workplace. With a focus on putting people first, the Commission has made significant changes in order to respond to an important increase in requests for service, particularly for the most vulnerable Canadians. Going forward, reducing this backlog of complaints and further improving our process to deal with them quicker is a Commission wide priority. In order to do this, the Commission has had to reallocate resources from other important human rights initiatives. Specifically, the Commission has reduced its promotion activities. Careful monitoring of this change together with the creation of a change management transition team has ensured continued alignment. Due to chronic underfunding, the Commission had to make difficult choices regarding its allocation of resources. Since many years, the Commission’s Information Technology infrastructure has been neglected. At risk was the ability of Canadian citizens—particularly the most vulnerable and those in remote areas—to access human rights justice through multiple access points. During 2017-18, the Commission took action to integrate its new online complaint form with its Case Management System (Horizon) in a secure and reliable way. The online complaint form, in a clear language, has allowed Canadians to file discrimination complaints directly through our website. This tool is now available in addition to multiple other means by which people can access our complaint services. However, in order to achieve better access to justice for all, it is necessary that the Commission be able to significantly improve its information technology and data management systems. This would allow us to improve access to services and support data analysis in order to better plan our work in light of emerging issues. Without this investment, it is very likely that access to justice for the most vulnerable and the middle class would be compromised. The Commission needs to support individuals, particularly those in vulnerable circumstances. Once again, underfunding put this important work in jeopardy. Knowing this, and understanding our limitations as a small organization, we have taken a coalition approach. The Commission strategy has been to nurture strong, collaborative, and integrated stakeholder partnerships with organizations having similar or complementary mandates. To achieve this, the Commission signed a partnership agreement with the National Association of Friendship Centres and has continued to engage with the Coalition for the Human Rights of Indigenous Peoples and the Canadian Association of Statutory Human Rights Agencies (CASHRA). We have also worked with Pro Bono Canada towards facilitating the advancement of some human rights cases and we have provided a number of information sessions to law faculties. Those key partnerships allow for greater dissemination of information about our complaint process and other programs for people needing assistance. Provide a national credible voice for equality in Canada – my Canada includes everyone; promote broadly human rights in Canada by raising public awareness of human rights issues; and engage civil society, governments, employers and the public in dialogue and action to affect human rights change. As Canada’s national human rights institution, the Commission ought to be a go-to source of human rights expertise. To this end, the Commission continued to be more proactive, more vocal and took on a greater leadership role in setting the human rights agenda in Canada. The Commission has identified a number of pressing and emerging human rights issues and has worked with external stakeholders to better coordinate its work. It signed on to collaborate on a number of research grant applications related to the two new grounds of discrimination added to the CHRA: “gender identity or expression,” and “genetic characteristics.” The Commission has started to develop policy positions on these issues, while also participating in related panels, consultations and discussions. It has also developed draft action plans for two areas of focus for the Commission: Hate and Intolerance as well as Economic, Social, Cultural rights. In addition, the Commission supported and provided advice to various external stakeholders and government organizations on emerging human rights issues, such as gender identity and expression, the upcoming Accessibility Legislation, as well as legislation and policies on sexual harassment and violence in the workplace. It also entered into agreements with the National Association of Friendship Centres and partnered with ProBono Canada with a view to ensuring that certain vulnerable groups have access to information about the Commission and its mandate. The Commission used its standing at the United Nations as Canada’s national human rights institution to monitor and report on how Canada is meeting its international human rights obligations domestically. Towards this end, we have consulted a number of key partners and have integrated their perspective and comments in the report. During 2017-18, the Commission submitted a shadow report for Canada’s review on the Convention on the Elimination of Racial Discrimination. The Commission also made a submission reviewing Canada’s performance pursuant to the Universal Periodic Review (UPR). The Commission consulted broadly with provincial counterparts and civil societies in the preparation of the UPR submission to ensure that it was informed by various perspectives. In addition, the Commission interacted with various domestic and international stakeholders and partners on various issues such as the ratification of the Optional Protocol on the Convention against Torture, etc. At year end, the Commission was also in the final stages of completing a research report in collaboration with CASHRA members and other stakeholders on Canada’s implementation of the United Nations Convention on the Rights of Persons with Disabilities. This third report on employment and disability is expected to be released in 2018. Provide people in Canada with a mechanism to file human rights complaints and remedies to victims of discrimination; reduce instances of systemic discrimination; and represent the public interest in legal cases to advance human rights in Canada. The Commission works to deliver a simpler, more user-friendly complaints process for everyone, driven by people’s needs. Our aim is to have a streamlined complaints process to resolve people’s issues efficiently, affordably, and fairly, either through informal resolution mechanisms or the formal human rights justice system. We must tailor our services to those who need our help, rather than asking them to adapt to the way we work. Here again, over and above processes, it is important to put people first. As planned, the Commission took concrete actions towards improving access to human rights justice for Canadians. The Commission continued to identify areas for strategic litigation which begins with the identification and processing of prioritized complaints. Over the past year, the Commission dealt with many cases that address areas of priority for the Commission, including cases dealing with: equity of services for Indigenous peoples; human rights in the correctional system; gender identity; sexual harassment, particularly in male dominated and/or security environments; and clarifying the scope of the CHRA as it relates to Indigenous peoples. At the same time, the Commission continued to implement a Lean approach. While early indications demonstrated a positive impact in terms of efficiency of complaints processing, the influx of inquiries and online complaints led to unexpected delays. The influx began soon after January 2017, when the Commission gave everyone in Canada the ability to email their discrimination complaints directly to the Commission. This initial opening of an online service channel generated an increase of 26% in the Commission’s inquiries in comparison to the previous year. Then, in September 2017, the Commission revamped its website to make it easier to find human rights information. As part of this revamp, the Commission also launched a new interactive online complaint form to improve access to justice and make it easier for people in Canada to file a discrimination complaint. The online complaint form, in a clear language, helped remove significant barriers to access to justice. At the same time, however, it created an additional surge in what was already an increased caseload. *October 2017 to March 2018, 6 months in operations. **As of March 2018, 593 online forms had not yet been triaged. During the transition, online forms are still reviewed at the early stage while refining efficacy of the screening tool. The Commission responded quickly in order to maintain an acceptable service level for everyone. As the demand for services rapidly increased, it was clear that we needed to address the overall workload and the increasing wait times. As well, we realized the need for greater coordination in our work in order to offer adequate services. The result was a Commission-wide initiative which included the creation of the Complaints Services Branch: an entire sector devoted solely to ensuring efficient and effective services to people who feel they have been discriminated against. Resources from other sectors were re-assigned to this branch, and corporate assistance from finance and HR focussed on supporting the new branch. In addition, a cross-branch transition team was established to ensure the success of this initiative. Ensure employer’s compliance with employment equity statutory requirements; encourage employers to identify barriers to employment and implement best practices to eliminate gaps in the representation of women, visible minority groups, Indigenous peoples and persons with disabilities. The Commission continued to modernize the way it serves and supports employers looking for guidance on how to comply with the requirements of the Employment Equity Act. The Commission analyzed information collected from audit findings gathered in 2015-16, 2016-17 and 2017-18, and created a database on employment barriers impacting the four designated groups. Using the knowledge derived from the analysis, results from consultations with employers, and a Lean mapping exercise, the Commission identified new ways to deliver on its audit mandate. Based on many years of audit experience, the progress achieved and outstanding challenges, the Commission developed a new approach to better contribute to equality in the workplace for the four designated groups. Scorecards displaying summative employment equity results were designed for employers in various labour market sectors. In the coming year, this tool will be shared with organizations who can then gauge their performance compared to their peers. As planned, the Commission developed an issue-based horizontal audit model and launched a pilot audit focusing on the employment of Indigenous peoples in the banking and financial sector. As a first step, and in response to the feedback we received from employers during recent consultations, the Commission sent an audit survey to 36 employers to gather information on systemic barriers and positive practices. To reach a larger audience and for greater impact, the Commission will publicize general audit findings, including a gender-based analysis on Indigenous representation, through its forthcoming industry-wide audit report. The new audit model includes an on-boarding process to share key messages and information on the audit process in group sessions. Various options were explored and tested including GCCollab, Webex and teleconference. The goal is to engage employers and support them in meeting their obligations. This could also act as a catalyst to promote exchanges of best practices between organizations on employment equity, diversity and inclusion. Actions were also taken to equip team members with better electronic tools to facilitate program delivery. Some tools for employers were developed to support the audit on-boarding process including information fact sheets on employment equity. The audit program’s survey on client service satisfaction is being modified to better respond to the new audit model. Financial, human resources and performance information for the Commission’s Program Inventory is available in the GC InfoBase. During 2017-18, the Commission piloted a People Empowerment Model through which employees were asked to bring forward ideas for improvements. Pilot participants would then vote on the idea, and, if approved, the employee who initiated the idea was asked to lead its implementation. This empowered employees to bring forward ideas and to enable their implementation. The model aims to foster an organizational culture that encourages innovation, ownership, collaboration and communication. The pilot was successful and will be expanded to other divisions in the coming year. During 2017-18, the Commission implemented the electronic submission of human rights complaints by integrating the new online complaint form with the Commission’s Case Management System (Horizon) in a secure and reliable way. Work on improving the electronic submission of human rights complaints will continue into this year. In addition, the Commission adopted a virtualized infrastructure and standardized technology which allowed us to reduce our physical IT infrastructure footprint by 80%. The implementation of this new technology resulted in decreased IT support costs, while also giving us a new IT platform that will allow IT to focus on high value business priorities instead of IT infrastructure support. During 2017-18, the Commission improved client privacy and information security by implementing new cyber security systems and by implementing recommendations in the Canadian Security Establishment Top 10 Security Actions. The Commission installed new perimeter security defence systems in addition to e-mail and web content filtering solutions. It also documented and developed processes for the automation of patch management for endpoint devices and servers. These initiatives have improved the overall IT security position of the Commission, and work will continue this year in terms of improving the maturity of the IT security program as a whole. This being said, in order to improve service delivery and access to justice for all, including the most vulnerable and the middle class, the Commission must absolutely modernize its systems, notably with respect to digital services and data management. This investment is necessary in order to implement interactive services and to support the government’s priorities in terms of diversity, openness and transparency. During 2017-18, the Commission reprioritized IM/IT projects in order to enable the use of new tools and mobile technology while also leaping forward in the adoption of modern technology. The work will continue into this year with the rollout of the mobility pilot project in June 2018 and the rollout of new mobile equipment and software for all employees by September 2018. This new model will allow employees to work wirelessly from anywhere in the Commission. During 2017-18, the Commission served as one of the co-chairs of the Small Agency Financial Advisory Group and played a leadership role in organizing five information sessions with the goal of improving efficiencies and sound stewardship for all small departments and agencies (SDA). The sessions were aimed at financial specialists within the SDA community and featured presenters from Central agencies and SDAs. The purpose of the sessions was to design new policies and directives which addressed SDA realities, as well as to share best practices. * Includes 14.25 FTEs for Internal Support Services that the Commission offers to other small government departments/agencies. ** Includes 17 FTEs for Internal Support Services that the Commission offers to other small government departments/agencies. Starting in 2017-18, the Commission reports under its core responsibilities as reflected in the Departmental Results Framework. Actual spending for 2017-18 was approximately $1.2 million higher than the actual spending for 2016-17 mainly due to the salary retro payments following the signature of new collective agreements. The Commission’s planned spending will remain stable in 2018-19 and decrease a little in 2019-20 because of the net impact of a reduction in Personnel funds and an increase in Operating funds that reduces the total amount for Employee Benefit Plan. ** Includes 14.25 FTE for Internal Support Services that the Commission offers to some other small government departments. *** Includes 17 FTE for Internal Support Services that the Commission offers to some other small government departments. **** Includes 23.25 FTE for Internal Support Services that the Commission offers to some other small government departments. For information on the Canadian Human Rights Commission’s organizational voted and statutory expenditures, consult the Public Accounts of Canada 2017–2018. Information on the alignment of the Canadian Human Rights Commission’s spending with the Government of Canada’s spending and activities is available in the GC InfoBase. The Commission’s financial statements (unaudited) for the year ended March 31, 2018, are available on the departmental website. In 2017-18, actual expenses were higher than the 2017-18 planned results and the 2016-17 actual expenses primarily due to an increase in salary expense from the retro payments following the signing of collective agreements and an increase in equipment expenses due to investments in modernizing the Commission’s Information Technology infrastructure. The Commission provided Internal Support Services to other government departments/agencies related to the provision of Finance, Human Resources, Procurement, Administration and Information Technology services. Since the new section 29.1(2)(a) of the Financial Administration Act received the Royal Assent on June 26, 2011, Internal Support Services agreements are recorded as revenues. The increases in revenues were due to increased services provided to current clients and the addition of new clients. In 2017-18, total net liabilities increased by $723 thousand from 2016-17, due to the increase in salaries payable because of underpayments due to the pay system complications and the increase in Accounts payables and accrued liabilities, related to increased investments in Information Technology infrastructure unpaid at year-end. Vacation pay and compensatory leave also increased mainly due to the salary increases following the signing of collective agreements. The increase in net financial assets of $729 thousand is mostly explained by the increase in accrued salaries and accrued liabilities as explained above, and the decrease in accounts receivable from Other Government Departments due to the decrease in receivable for Employee Benefit Plan. The increase in non-financial assets is due to the Commission’s continuous investments in capital projects and the modernizing of its Information Technology infrastructure during 2017-18 that increased the net book value of Tangible capital assets. Institutional head: Marie-Claude Landry, Ad. E.
The Canadian Human Rights Commission’s Strategic Outcomes and Program Alignment Architecture of record for 2017–18 are shown below. 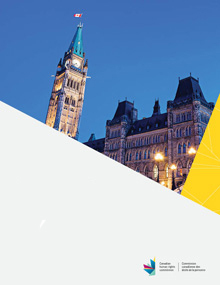 For the purpose of the 2017-18 Departmental Results Report, those high-level themes outlining the government’s agenda in the 2015 Speech from the Throne, namely: Growth for the Middle Class; Open and Transparent Government; A Clean Environment and a Strong Economy; Diversity is Canada’s Strength; and Security and Opportunity.